More than 100 residents turned up for a council planning meeting to show their opposition to large-scale development plans. Morpeth Town Council’s Planning and Transport Committee was forced to move from the Council Chamber to the larger Corn Exchange for its meeting last week to accommodate the numbers from the Morpeth North Residents’ Action Group (MNRAG). When we looked into the Mitford Estate proposal, we were utterly horrified that it runs against almost every tenet of the Neighbourhood Plan. Prior to the session last Wednesday, the group gathered outside Morpeth Town Hall in a demonstration against plans by the Mitford Estate to build up to 280 houses, a roadside service area, hotel, employment units and countryside park on a greenfield site west of Lancaster Park. And before councillors considered their response to the application, MNRAG member Dr Colin Coates outlined the group’s concerns. He said residents accepted there was a need for more housing and business support in the town, but it should be on brownfield sites identified in the Morpeth Neighbourhood Plan, not on a greenfield site outside the settlement boundary that would reduce the separation distances between Mitford, Morpeth and Fairmoor. “When we looked into the Mitford Estate proposal, we were utterly horrified that it runs against almost every tenet of the Neighbourhood Plan,” he said. Dr Coates said there is also a fear that the commercial element of the scheme could damage the town centre and would be an eyesore on the edge of Morpeth. 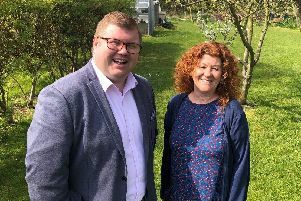 He called for an Environmental Impact Assessment to be carried out into the potential harm to wildlife in Scotch Gill Woods, the River Wansbeck and the green corridors around the area. Other concerns focused on the sewage, drainage and surface-water run-off management, the impact of the whole scheme on infrastructure, traffic, health services and schools, and the location of a service area next to homes. “It is placing a commercial area right next to people’s houses,” said Dr Coates. Town councillor Les Cassie, who is not a member of the planning committee, also spoke in support of the objectors. He agreed that an impact assessment is required and echoed MNRAG’s comments about sewage and drainage, the settlement boundary, greenfield development and wildlife. He added that Morpeth does not need development on the proposed site as it now has a five-year supply of housing, and he talked about the impact on local services. “An application for housing must include some element of mitigation for the damage the application is going to do,” he said.